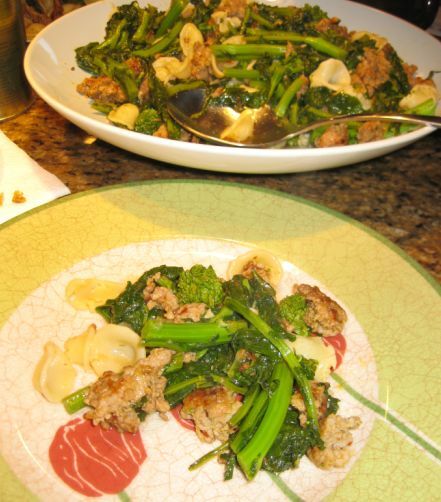 Rapini also known as Broccoli Rabe is a common vegetable in Chinese, Italian, and Portuguese cuisine. 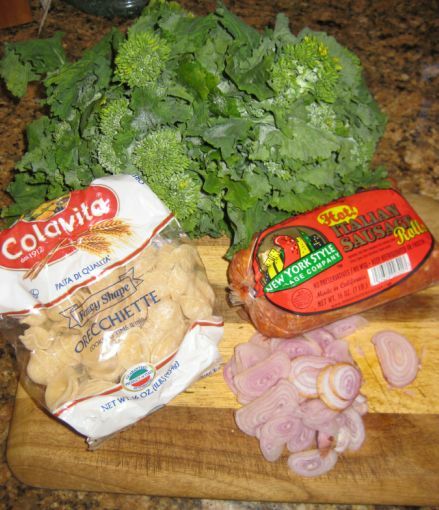 The flavor of rapini has been described as nutty, bitter, pungent, and "an acquired taste". 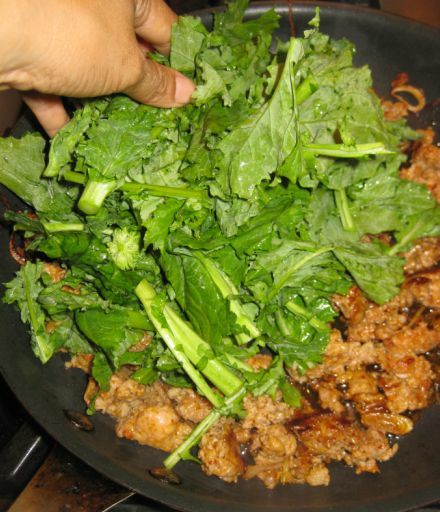 Rapini has leafy green vegetable that is frequently eaten in Southern Italy and has become popular in the United States. 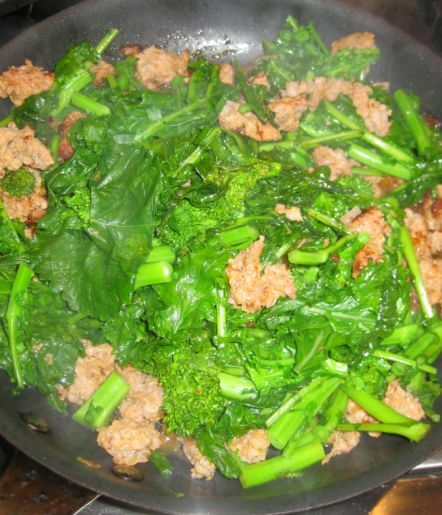 The vegetable has a slightly bitter taste and is frequently steamed or lightly sautéed in olive oil. 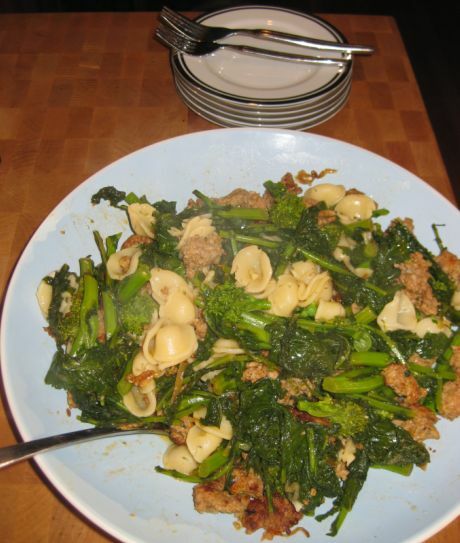 For this dish, I am using Orecchiette, meaning little ears in Italian, but any small size pasta will work such as Penne, combining with Italian sausage and Rapini. Like I said Rapini is an acquired taste because it is bitter but that is what Hoa and I we like about this vegetable. Kevin on the other hand can't not eat this dish. Each time I make this dish, Kevin always said:" how can you eat this dish, it is so bitter!" 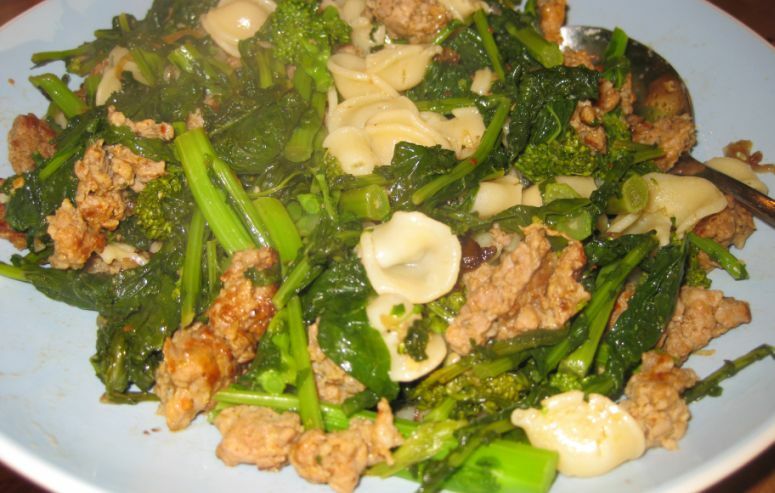 Italian traditionally served Rapini with Orecchiette and sautéed sausage. 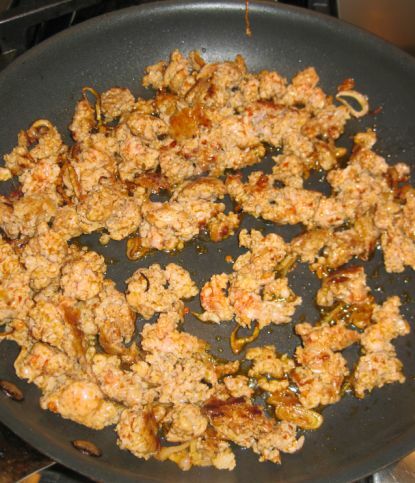 This dish is really easy to make and it is also a healthy choice. 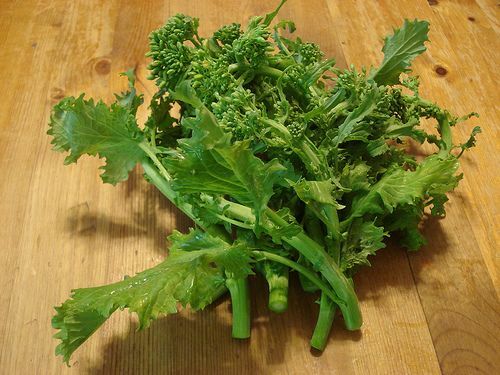 Here is how rapini (Broccoli rabe) looks like. 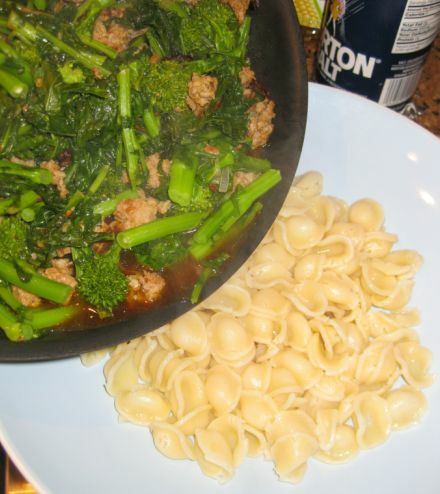 Orecchiette, shallot, Spicy Italian sausage, and rapini. I ran out of garlic so I am using shallots instead. 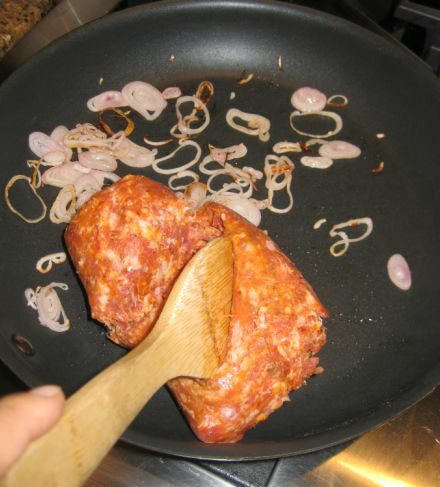 Shallots are sautéed and then Italian sausages are added to the pan. 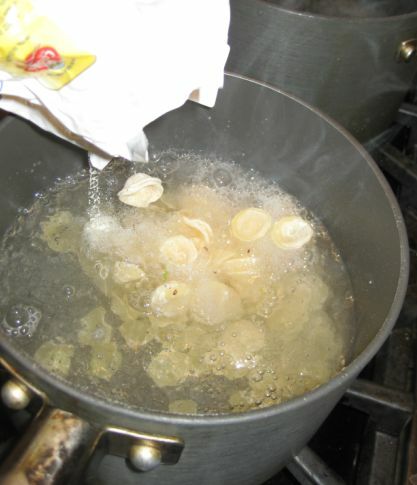 Orecchiette are poured into a pot of boiling water and cooked for about 10 minutes. 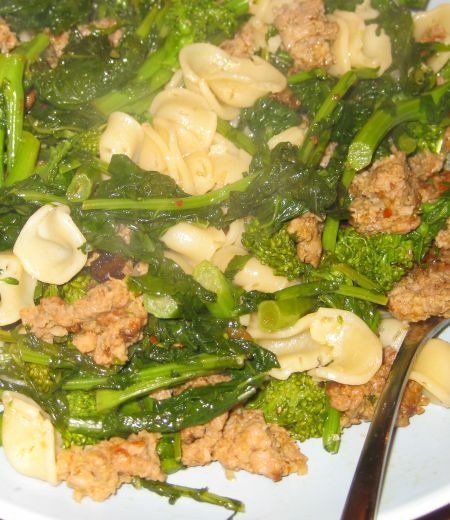 In the mean time rapini is added to the pan with Italian sausage. The rapini is soft and is ready to be served. 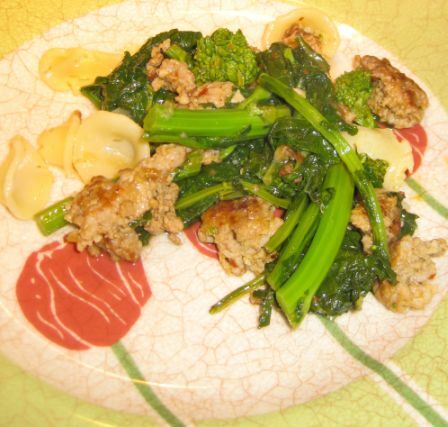 Next, the sautéed rapini is poured into a large plate with the oriecchette.